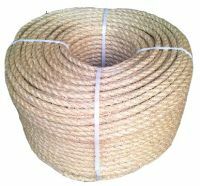 This is our premium quality superior sisal rope manufactured for us in Europe. The superior yarn used by our manufacturer results in a smoother, less hairy finish which gives a more refined look to this sisal rope. 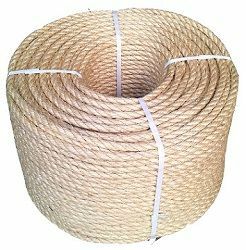 We keep the following diameters in stock: 6mm, 8mm, 10mm & 12mm, for larger diameter sisal please visit our main Sisal Rope page. Sisal is a good strong traditional rope made from natural fibres that is especially resistant to sunlight and stretches very little. It is ideal for use in the garden and being natural it complements planting, decking, timber work and pergolas. Sisal is also used for cat scratching posts and parrot toys. A natural dry white sisal that has not had any extra chemical treatment for a high grade rope from Ropes Direct. 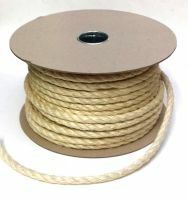 Please click on the icons below to buy this sisal rope by the coil, by the reel or cut to length by the metre.